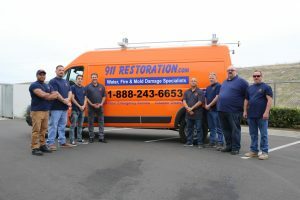 It is important that home and business owners have access to the quality restoration services of 911 Restoration of Inland Empire the moment they experience any type of property damage. When you discover a leak in your roof or notice black mold growing throughout your drywall, you can count on our trained professionals to arrive quickly, fully prepared to provide you with a free visual property inspection. Our company has many years of experience restoring both commercial and residential properties after they have been affected by a disaster, making us one of the most versatile and qualified restoration companies in the industry. We are trained to handle everything, from instances of water damage and sewage backups to mold infestations and property fires. We know the ins and outs of every property disaster you may experience, which should give you peace of mind when you hire our specialists. By offering this level of customer care, our water damage Inland Empire professionals want to make home and business owners hopeful about the fresh start they will receive once we are on the job. So, give us a call today and we will go the extra mile to get your property restored in no time! Even if you maintain your home or business to the best of your ability it is likely that at one time or another you may be confronted by a pipe burst, ceiling leak or flooded bathroom. Once water invades the premises it can very quickly begin to deteriorate the property. This is why time is a major factor in providing successful water damage restoration services. When water is left to sit for an extended period of time it can cause structural damage, rotting, rusting and mold growth. In order to prevent these issues and to properly mitigate the water damage, we guarantee to arrive within 45 minutes to begin same day services. We want to be the technicians that you rely on to repair your property after it has been affected by water damage. So, call us if you need emergency flood cleanup services and we will arrive quickly, fully prepared to begin restoring your home or business. Mold can show itself in many different forms and each one of these poses different risks for the property and the people exposed to the substance. Green, brown and pink colored molds are the most common and are usually caused by water damage. Mold can be found in bathrooms, kitchens, attics and behind wallpaper, among other places. When inhaled these molds can cause allergy-like symptoms, skin rashes and respiratory issues, such as asthma. 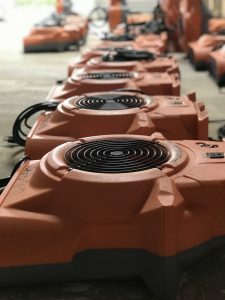 We have extensive experience cleaning up mold infestations and use techniques that allow us to remove the substance without spreading it further throughout the property. We will do everything we can on our end to turn your property back into a clean and safe environment. Mold can spread throughout a property very quickly, which is why it is important to call us for a free visual inspection the moment you discover any signs of mold in your home or building. When there is even just a slight problem with your sewer line it is important to immediately take notice, otherwise you might find yourself dealing with a toilet overflowing with black water. Raw sewage inside your home can pose a significant health risk, not to mention create a rather unpleasant environment inside the property, to say the least. This black water is filled with bacteria and toxins, which is why you should avoid contact with the substance and never attempt a sewage backup cleanup on your own. While you wait for assistance it is important to keep children and pets away from the affected area. Along with the implementation of wet vacs, we will use powerful cleaning agents to completely disinfect and deodorize the area after a sewage backup occurs. Our crews are trained to remediate all aspects of black water overflows, including mitigating any water damage present. So, give us a call at the first sign that you may need sewage backup cleanup. It can be shocking how much damage a fire can cause throughout a property. Not only can the flames create ash and smoke, but the fire hoses can pump gallons of water into your home, causing significant water damage. In order to provide you with comprehensive fire damage restoration efforts, our experts make sure to use eco-friendly cleaning agents to remove ash, tar and smoke stains. We will also use sump pumps, wet vacs and air movers to address the water damage issue. There is also the foul odor of smoke that can linger inside the building if not addressed properly. Our professionals will get your property smelling fresh and clean, leaving no trace of the past fire. It is important to remember that the first call you should make after discovering a fire in your property is to the fire department, but after the flames are extinguished call us to take care of the rest. 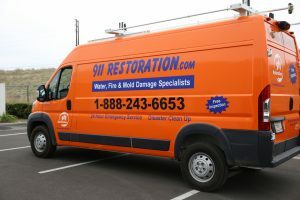 Disaster can strike at any moment, and when it does you can call the disaster restoration unit at 911 Restoration. We are constantly standing by, so you can reach out to us the moment you find yourself dealing with any disaster that may befall upon your home or business. If an earthquake causes structural damage to your building or a powerful storm knocks a tree through your home’s window, you can count on us to arrive quickly and fully prepared to get to work. On top of providing exemplary restoration services, our water damage Inland Empire techs also make sure to give each customer the specialized attention they need to feel confident in the work being done on their property. Customer service is a big part of disaster restoration and we take great measures to ensure every person we work with feels heard and supported when we are on the job. So, when you need the best disaster restoration services in the industry, call our water damage Inland Empire experts!